Most people nowadays have a 401k at work and no traditional pension. Before 401k's and IRAs existed back in the early or mid 20th century the traditional defined benefit pension was the norm. But gradually over the decades the defined benefit pension has been gradually dying out and defined contribution pensions (like 401k's) have become the norm. 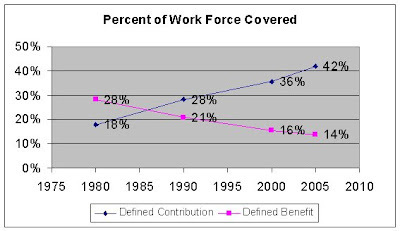 The chart below shows the % of the workforce that is was covered by both kinds of private pension plans from the 1980's till 2000's. As you can clearly see here that the trend is up for the defined contribution plans like 401k's and is down for the traditional defined benefit plans. You might notice that the other day I said that 20% of the country is covered by defined benefit pension but the above chart shows 14% covered as of 2005. The data above showing 14% is for private pension plans but the total 20% number was also including pension plans. I got the data from census documents with historical pension data and data on the Labor force.